Will call 7 PM, doors 7:30 SOLD OUT! Colleen is the alias of French musician Cécile Schott. 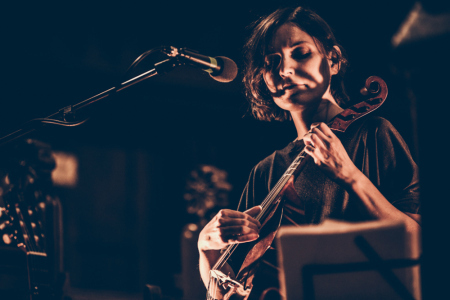 Over the course of five albums, she has consistently reinvented herself by taking acoustic instruments out of their usual context and pushing the boundaries of their playability, with compositions ranging from the mysterious and contemplative to kinetic and playful. For this concert she’ll be playing the Baroque viola da gamba with live electronic processing – and singing! Her new album Captain of None (Thrill Jockey) is her first with lyrics; it’s the most melodic in her repertoire, featuring fast-paced tracks rooted by prominent bass lines and assorted percussive effects. Seattle composer/vocalist Hanna Benn opens with a rare solo set. Benn studied composition and sacred vocal music at Cornish College of the Arts. Her works and arrangements have been performed by various ensembles including Saint Marks Cathedral Choir (Seattle), Indianapolis Symphony Orchestra, the CMF Festival Orchestra, Saint Helen’s String Quartet, Seattle Chamber Players and Opus 7. She is currently on commission with the Northwest Symphony Orchestra and a recipient of the National Science Foundation grant to create a site-specific work.